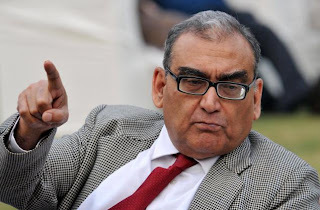 Press Council chief Markandey Katju received a notice from Mumbai Police asking him over his daring to order Maharashtra CM Prithviraj Chavan to inquire in to the wrongful arrest of a woman for protesting against a bandh following Shiv Sena chief Bal Thackeray's death. The development came after Maharashtra CM saw the letter lying on his desk written by some Katju ordering him to probe in the arrest matters. Police Inspector Shinde who was present in the cabin of the CM said "After watching the letter, Mr. Chavan asked me who this Katju is. I have never heard his name. How dare he ordering me? Enquire him who is this guy and take him under custody. This guy is spreading angst for the Maharashtra Government arrest him under section 341, 342." Shinde said "We just wanted to understand why this guy was unnecessarily talking. Therefore we sent a constable." Acting on Chavan's instruction, Mumbai Police immediately sent Katju a notice and Hawaldar Pandu went to arrest him. However, after viewing many news reports saying that Press Council chief Katju wrote a letter to Chief Minister of Maharashtra removed all the ambiguities and Prithviraj Chavan took back his orders and avoid further embarrassment for Maharashtra.